Tokyo - Marunouchi: Tokyo Imperial Palace | Flickr - Photo Sharing! Kōkyo (皇居), or the Tokyo Imperial Palace, is the main residence of the Emperor of Japan. The Palace is sited on the former site of Edo castle, the former seat of the Tokugawa shogun who ruled Japan from 1603 until 1867. Built by Tokugawa Ieysau in 1590, it became the world’s largest castle under his successors in the Edo period. In 1868, the shogunate was overthrown, and when country's capital and Imperial Residence were moved from Kyoto to Tokyo, Edo Castle was renamed Tokyo Castle (東京城, Tokyo-jō) and then Imperial Castle (皇城, Kōjō). After being destroyed by a fire, the new Imperial Castle (宮城) was constructed in 1888. The palace was destroyed again during World War II, and rebuilt in the same style afterwards. The inner grounds are only open to the public on January 2 (New Year's Greeting) and December 23 (Emperor's Birthday). During the rest of the year, guided tours of the palace are offered in Japanese, with an English pamphlet and audio guide provided. 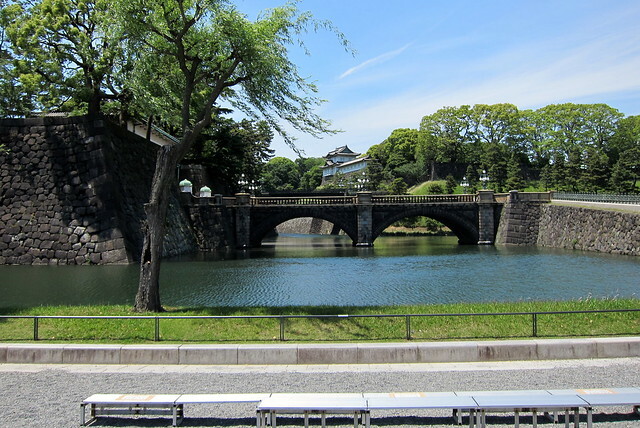 From Kokyo Gaien, the large plaza in front of the Imperial Palace, visitors can view the Nijūbashi (二重橋), a pair of double arched stone bridges crossing the Nijūbashi moat forming an entrance to the inner palace grounds. The stone bridge in front is called Meganebashi (Eyeglass Bridge) for its looks. The bridge in the back was formerly a wooden bridge with two levels, from which the name Nijubashi, Double Bridge, is derived. mountainhsu and Ola 竜 added this photo to their favorites.